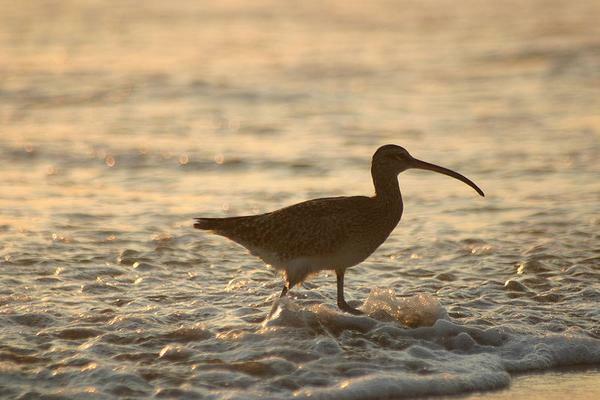 Whimbrel (photo by Arturo Mann from Wikimedia Commons) This bird is not Hope. News from the Caribbean, especially Puerto Rico, is horrific now that two Category 5 hurricanes have passed through the islands in just two weeks. Homes, infrastructure and habitat are all destroyed. Our hearts and help go out to everyone affected by these storms. Images of the widespread damage also have made me wonder: Did birds survive these hurricanes? Early this month one particular bird, a whimbrel named Hope, survived Hurricane Irma on St. Croix, U.S. Virgin Islands. Did she survive Hurricane Maria? We don’t know yet. North American whimbrels (Numenius phaeopus) that breed in the tundra of northwest Canada make long migrations to their wintering grounds in the Caribbean and South America. To understand their migration The Center for Conservation Biology fitted a few of them with satellite transmitters when the birds made migration stopovers on Virginia’s eastern shore. One bird, nicknamed Hope, was tracked for three years beginning in 2009. Her transmitter was removed after it broke in 2012 but she still wears two colorful leg tags. Every year she returns in late August to St. Croix. After Hurricane Irma I was encouraged on September 13 when The Center for Conservation Biology sent news that Hope had survived Irma. The map below provides perspective on this miracle. Then on the night of September 19 Hurricane Maria blew through the islands, passing only 10 miles south of St. Croix. Hurricane force winds scraped the island for 7.5 hours before slamming Puerto Rico. The southwestern corner of St. Croix was hardest hit. As with Hurricane Irma it will take a while to find out what happened. And I wonder: Did Hope make it through Maria, too? We’re waiting for news … again. Read more about Hope surviving Hurricane Irma — and see photos of her — in this article at The Center for Conservation Biology. p.s. For more news of the Virgin Islands see the Virgin Islands Daily News. Kate, I really hope that the Whimbrel survived hurricane Maria. I can’t wait for good news. I have been wondering the very same thing! I live on St. Croix but have not made it over to Great Pond to look for her. I really hope she survived! Joan, If you do get news of Hope, please post it here! I have not heard anything yet. I just sent a friend request to Lisa Yntema to see if she has seen Hope since Hurricane Maria. I’ll try to remember to update you. Any news on sightings of Hope? I share her story with school children here in Montana and would love any update. (And thank you for this article…at least she survived one more hurricane.) Thanks! Beth, I haven’t heard any news but here’s a way to find out. Bryan Watts at the Center for Conservation Biology wrote the article about Hope surviving the first hurricane at this webpage: http://www.ccbbirds.org/2017/09/13/hope-survives/. Bryan’s email address and phone number are in the by-line on that article so you can contact him directly and get the news to tell your students.